It is an 1842 legal arrangement to celebrate annually 24 low masses for the intentions of the donor, which are specified below. The document is signed by the notary and dated 1 April 1842– that of the registration of the records kept by the notary. This was a legacy (gift) from Jean-Marie Vianney for masses to be said in perpetuity, which would be paid for from the interest accrued from his original gift. This is a very common occurrence that often in wills, people set aside money for the saying of masses, usually for the soul of the departed, but in this case, for other reasons. It is like a will. 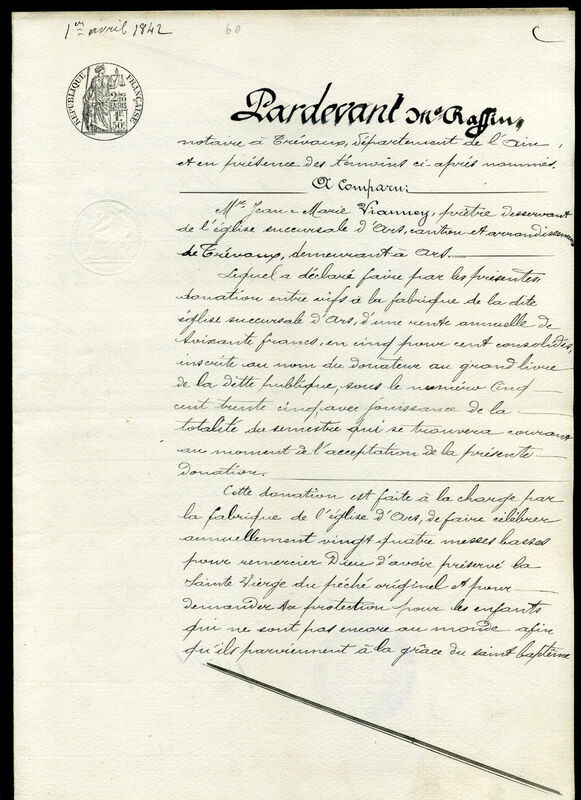 So, this is a legal document, because signed by a notary (here Gayot), most likely a copy asked for after the death of the original notary, Raffin. ‘Expedition’ (at the bottom of the second page) means a copy of the document sent by the notary. Since he signs it, it is a legal document. In the presence of Maître Raffin, notary in Trévaux, department of Ain, and in the presence of the witnesses named below. 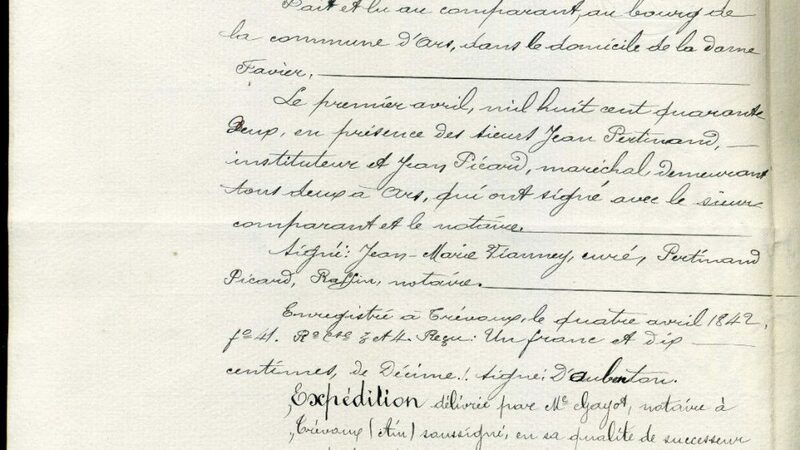 Mr. Jean-Marie Vianney, priest serving the chapel of ease of Ars, distrct and borough of Trévaux, dwelling in Ars has declared making, by the present, a gift between living persons to the church council of the said chapel of ease of Ars, of an annual annuity of sixty francs, at five percent bound rate of interest, registered in the name of the donor in the general ledger of public debt with the number five hundred thirty-five, with dividend rights for the whole semester from the date of the acceptance of the present donation. This donation has made it the responsibility of the church council of the church of Ars to have twenty-four low masses celebrated annually to thank God for having preserved the Holy Virgin from original sin and to ask for his protection for the children who are not yet born so that they will receive the grace of baptism. The stipend for each of the masses to be celebrated in perpetuity in the said church of Ars will be of one franc and twenty-five cents, making a total of thirty francs, payable to the serving priest of the church fo Ars. Written and read to those present, in the town of the commune of Ars in the house of Madame Favier. The first of April, eighteen hundred forty-two, in the presence of Mr. Jean Pertinaud, teacher, and Jean Picard, blacksmith, both inhabitants pf Ars , who have signed below along with the appearing party and the notary. Signed : Jean-Marie Vianney, priest, Pertinaud, Picard, Raffin, notaire. 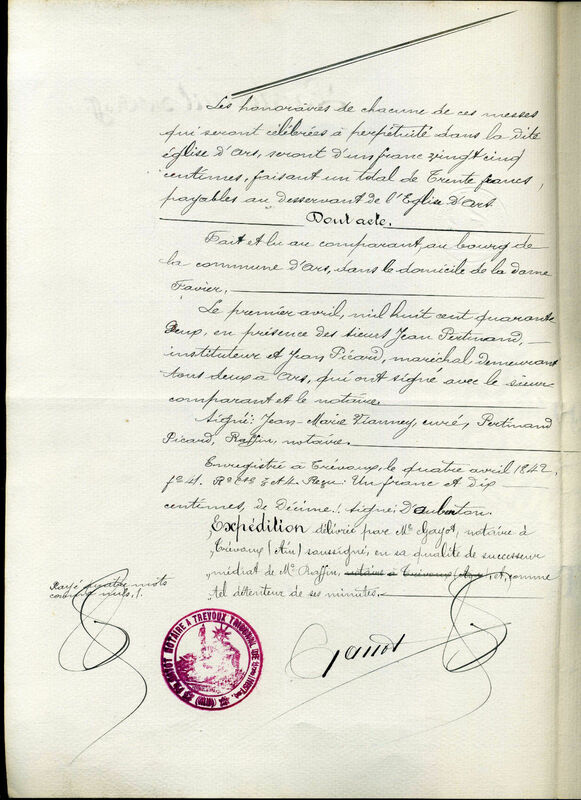 Copy issued by Maître Gayot, notary in Trévaux (Ain) undersigned, in his position as immediate successor to Maitre Raffin, and as such, the holder of his records. A chapel of ease takes the overflow of congregants. Papal Artifacts is grateful to Dr. Jennifer Walski of Bordeaux, France, for her gracious help in the translation of this document. St. Jean Vianney, the patron saint of parish priests, is very dear to the Curator. Consequently, he has several artifacts belonging to or associated with the saint.